Tokyo, December 27, 2012 - Fuji Heavy Industries Ltd. (FHI), together with Subaru Tecnica International Inc. (STI)*, announced its exhibition at the upcoming Tokyo Auto Salon 2013 with NAPAC (Japan Car Parts and Aftermarket Promotion Association), which will be held January 11th to 13th, 2013 at the Makuhari Messe in Chiba prefecture. 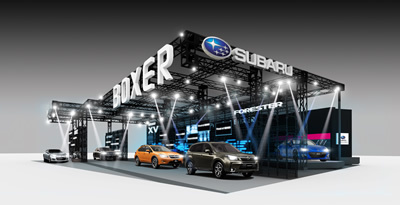 On the theme of Subaru booth design "Unchanging spirit pursuing driving pleasure -Proud of BOXER-", it will showcase through Subaru's unique products. The concept is "High-grade sports car for adults". For interior, parts with a feeling of quality such as "Tan-colored leather interior" have been employed. For exterior, high-brightness special metallic color equipped with black-colored exterior parts such as carbon roof and 19-inch aluminum wheels accentuates its appeal as a sports car. Focusing on highway driving and city cruise, it has been customized as an "On-road super SUV" based on the new Forester. The new Forester's driving performance enhanced by the Direct Injection Turbo "DIT" engine has been advanced for on-road driving. Its handling performance and fun to cruise like a GT car have been expressed with its distinctive styling. Under its concept "Super off-road SUV", large tyres, increased ground clearance and Subaru AWD system have been employed. They achieved comfortable ride on any road surface. Subaru XV's unique driving pleasure has been further refined. Throughout the theme of its booth design "Unchanging spirit pursuing driving pleasure -Proud of BOXER-", the booth was designed in the image of catwalk of fashion shows. Subaru lineup will be exhibited in the same direction under the light, sound and image effects. The racing cars for Super GT race, 24 Hours Nürburgring endurance race and International Rally Challenge (IRC) will be exhibited. Subaru BRZ, Subaru XV and the new Forester which embody "Enjoyment and Peace of Mind" driving experience will also be at the booth. Starting from the announcement of Subaru's 2013 motorsports' entries, five talk shows will take place during the exhibition. Rally driver Toshihiro Arai and other race drivers who joined Super GT races and 24 Hours Nürburgring endurance race will appear on the stage. In addition, a caravan called "Forester Live" to demonstrate the new Forester's vehicle performance in the five major continents will be broadcasted live. The special site for Subaru Auto salon will be opened on December 27. By using the USTREAM live streaming provider, events in the Subaru booth will be broadcasted live. Displayed racing cars: Subaru BRZ GT300; Impreza WRX STI 4-door (scheduled participation in the 2013 24 Hours Nürburgring endurance race); and Impreza WRX STI 4-door Group R4 specification model; Subaru BRZ "GAZOO Racing 86 / BRZ Race" (Tentative). Subaru will announce its entries of the Super GT races, IRC and 24 Hours Nürburgring endurance race in 2013.